Use what the professionals use, for complete clothes moth eradication! PRICE WATCH PROMISE - we guarantee you will not find cheaper anywhere else online! Our Standard Clothes Moth Killer Kit provides everything you need to deal with a clothes moth infestation in one room or double wardrobe. If you’ve discovered moths have eaten holes in your woollens, silks or cashmeres, then the comprehensive range of carefully selected clothes moth products in our Kits will help you get rid of clothes moths fast and maintain long-term clothes moth control. The professional-grade clothes moth insecticides in our Kits are supplied by market leaders Pest Expert and are HSE-approved for the amateur market, making them the most effective clothes moth killers available for DIY use, and delivering unbeatable results. All our Clothes Moth Kits have been designed with ease of application in mind to make the process uncomplicated and problem-free, and are supplied with step-by-step directions for use to enable you to carry out a simple yet highly effective clothes moth treatment. 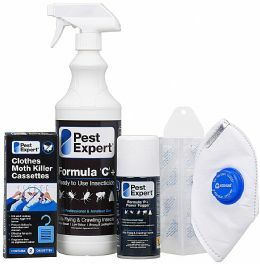 1 x Pest Expert Formula 'C' Moth Killer Spray 1 Ltr: Our best-selling clothes moth spray, Formula ‘C’ is the strongest moth killing insecticide on the amateur market. For application to the insides of wardrobes and drawers, Formula ‘C’ kills clothes moths on contact as well as leaving a residue that remains effective for up to 12 weeks, offering long-lasting clothes moth control. 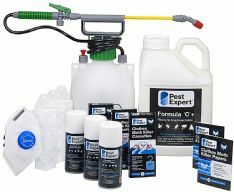 1 x Pest Expert Formula ‘P’ Fogger: A powerful fumigator, Foggers release an insecticidal gas that expands to completely fill a room, penetrating even hard-to-reach areas to kill all adult moths. Foggers do not present any fire risk as they are an aerosol device and so should not be confused with smoke bombs marketed elsewhere as 'Foggers', which need to be lit and left smouldering! Foggers can even be used in enclosed spaces such as walk-in wardrobes as they will not leave any unpleasant deposits on clothes or soft furnishings. 2 x Pest Expert Moth Killer Hanging Units (1 Twinpack): An excellent product for safeguarding clothes in wardrobes and drawers, these Units contain ‘transfluthrin’ a powerful yet odourless insecticide which kills moth eggs and larvae as well as adult clothes moths. Each Twinpack will provide protection to a standard double wardrobe for up to 6 months. 1 x Demi Diamond Carpet Moth Pheromone Trap and Holder: This professional-standard moth trap consists of a pheromone lure that attracts and traps the male clothes moth, preventing reproduction and stopping moth numbers from increasing. Moth traps are an excellent method of monitoring clothes moth activity following treatment. Each pheromone pad is effective for up to 3 months. NB: If treating more than one room, an extra Fogger is recommended for fumigation. Additional Pest Expert Hanging Units and other moth killer products can also be added from our extensive range. For more extensive clothes moth infestations, or to carry out clothes moth treatment to walk-in wardrobes or several double wardrobes, please see our larger Clothes Moth Killer Kits which contain greater quantities of the same products. Impressed with the effectiveness of the kit and the fast delivery. Every single product has its own use, all of them in a good combination have gotten rid of the moths! Very effective products and at a good price too! Only saw a tiny moth in my wardrobe but bought this as a precaution. Very good! This has everything you need to protect clothes from moths. We followed your instructions, found this easy as everything in the box was as described. It's too early to comment on the outcome, hopefully the larvae have been successfully removed. Your delivery was on time, we found you very helpful, would certainly recommend you to friends. Quick and efficient service and delivery. Now let's see what the moths think! This is the most comprehensive moth control I found on the market. Having discovered I had moths I found this company online and bought the standard kit to treat the room with. The kit arrive promptly and the instructions were very easy to understand and the procedure easy to carry out. It looks like it will do the job so I would use again and recommend this company. Carpet and clothes moth products Ordering easy and quick delivery. Not knowing much about moths I preserved a carpet moth killer kit and a clothes kit. I could have been more selective as some products were duplicated. I had an additional query which was very quickly answered and clearly described action. brilliant product and service The products arrived very quickly and were amazing. It looks as though we might finally have solved the moth problem. I have found MothKiller to be very efficient and professional in their service and their products. Very quick delivery and well packaged. Highly recommended. Fast action to full satisfaction using mothkiller products Excellent fast response when ordering goods. When programme on lady pest controllers used products to eradicate various pests I took the hint of what type can be best used on a current and widespread moth problem. After researching on the internet for traps and sprays I found an excellent site and ordered some products. They arrived within a day and the traps have already caught several moths. I see moths every day at the moment and also use the spray, which is very effective. This is very satisfactory since ordinary flykiller does not seem to deter moths. Prompt receipt of order and also helpful technical advice given when I telephoned for some advice. So pleased with the clothes moth killer products and the detailed info and instructions both on the website and included with the products. Top notch service and super quick delivery time. The kit was delivered quickly and does exactly what it says, very easy to use and with clear instruction. They're gone! On moving into a new flat, my daughter found signs of a bad moth infestation. After treating the whole flat with the moth killer treatment the moths are gone! Good service. Quick and efficient service and delivery. Now let's see what the moths think! Great product, delivered quickly. This is the most comprehensive moth control I found on the market. Goods were delivered next day and clothes moths are now completely gone. I also ordered some moth proof bags which were very good for housing cashmere sweaters. Overall, excellent company and products. It all did exactly what it said it would! Very happy with this kit, lost a couple of woollens to clothes moths prior to its arrival but nothing since. Goods arrived next day, seems to have done the job. I bought this kit having noticed holes in one of my cashmere jumpers. The products seemed to work very well, instructions were easy to follow, and most importantly... no more holes in my clothes! Highly recommend.